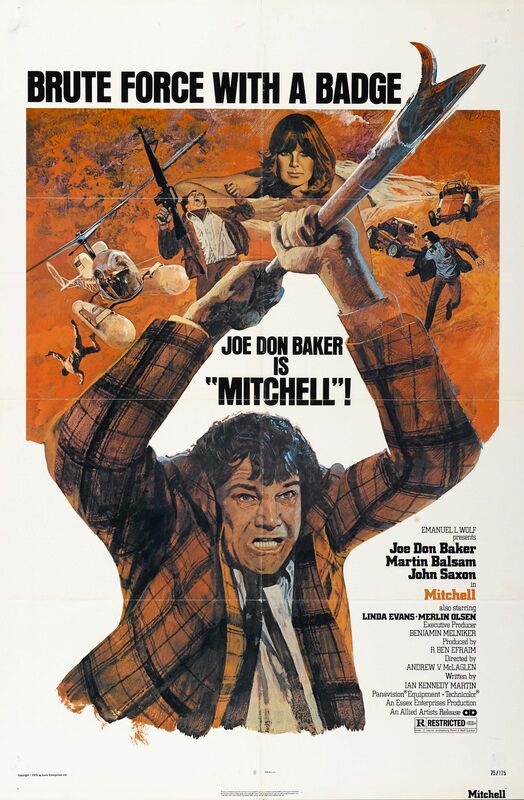 Mitchell is a 1975 film starring Joe Don Baker as an abrasive, alcoholic police detective, released by Allied Artists Pictures Corporation in the USA on September 10, 1975. It was directed by Andrew V. McLaglen. Very much an anti-hero, Mitchell often ignores the orders of his superiors and demonstrates disdain for by-the-book development work as well as normal social graces. The film also stars John Saxon and Martin Balsam as the banking criminals Mitchell pursues and Linda Evans and Merlin Olsen in supporting roles as a prostitute and henchman, respectively. Mitchell was re-released by Lorimar Productions in the 1980s. On October 23, 1993, the edited-for-television release of Mitchell was featured as an episode of Mystery Science Theater 3000. The film was trimmed by several minutes to match MST3K's format. This resulted in John Saxon's character, killed by Mitchell in a deleted scene, simply vanishing from the action. The only mention of his disappearance was a voice over by a radio announcer stating that Saxon's character had died. Tom Servo remarks on this lapse with the question, "Hey, guys, wasn't John Saxon in this movie?" Particularly mocked were Mitchell's alcoholism, slovenliness, and uncouth behavior.